The romantic ambience, top notch service, and European vibes stole our hearts. Filled with Italian goodness, this quaint fine dining cafe is pretty much perfect for a cozy brunch or a date with bae, especially if you pick their outdoor seating on a cool, breezy winter evening. If you haven’t checked this place out, then do your friends and yourself a favour and gift them a Gourmet Passport membership because this place shouldn't be missed out on. This restro not just boasts a fantastic concept of employing dumb and deaf staff but also serves some lip-smacking Indian food. They also offer the world’s street fare such as ramen, pasta, rolls, pizza and more. You can couple the spread with a regular fare of spirits and even mocktails. This place strictly works on prior reservations plus with Gourmet Passport’s membership, you don’t have to worry about burning a hole in your pocket. The warm, sophisticated ambience with jazz music in the background makes The Good Wife an ideal place to brunch. They have an extensive buffet range that lets you indulge in unlimited alcohol and food. They have a wide range of appetizers and small plates that you can pick and choose from which will be served on your table and one can self-serve themselves with the salads and desserts. Double this fine dining experience with Gourmet Passport membership and save up to 50% on your bill. SodaBottleOpenerwala is much revered for its Parsi dishes with a Mumbai twist to it. From the classic dhansak, berry pulao and patra ni macchi for the mains, to mawa cake or apple pie custard for dessert, it’s worth every penny. Currently drooling on their bacon vada pav which is a classic tribute to the Mumbai’s favourite street food along with the goodness of bacon. Their shooters and cocktails need to be on your list, too. Call your squad and make things happen with Gourmet Passport’s membership because they have 1+1 offers on food and drinks all year long. 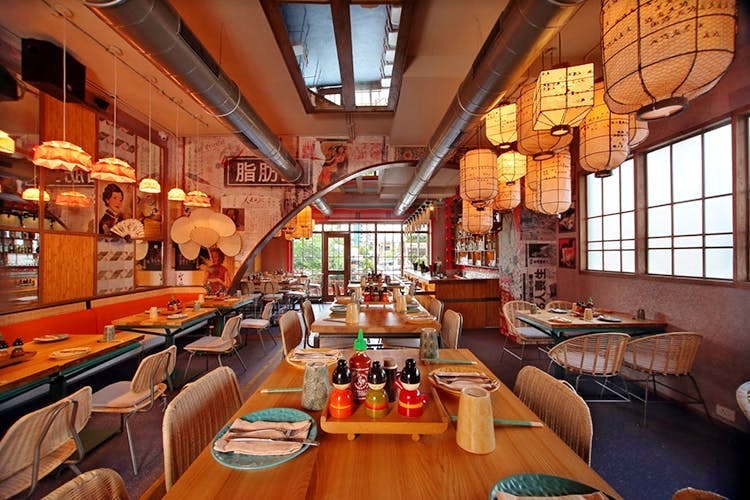 With their Japanese styled interiors and authentic Asian vibe, The Fatty Bao will be your go-to place during those sushi and ramen cravings. They have some delicious small plates, soupy noodles and an entire section dedicated to Onigirazu Sushi (sandwich sushi), bowls of hearty ramen and delectable desserts. The fully stocked bar makes it the perfect destination for family gatherings where spendings are less and savings are more with Gourmet Passport. Check out their website to understand the drill and browse through some of the finest restaurants in your city on their web & app. Follow them on Facebook, Instagram & Twitter to stay updated about their exciting offers.